Welcome to the New Release post showcasing projects from Our Daily Bread Designs August Release! You can see all of the August Releases here. Continue reading below to find out how you can win one of three $15 Gift Certificates to the ODBD Store good towards the purchase of ODBD stamps. Today I'm sharing two Fancy Folds cards using a few of the new August stamp sets and custom dies, along with some older ODBD stamp sets and paper. 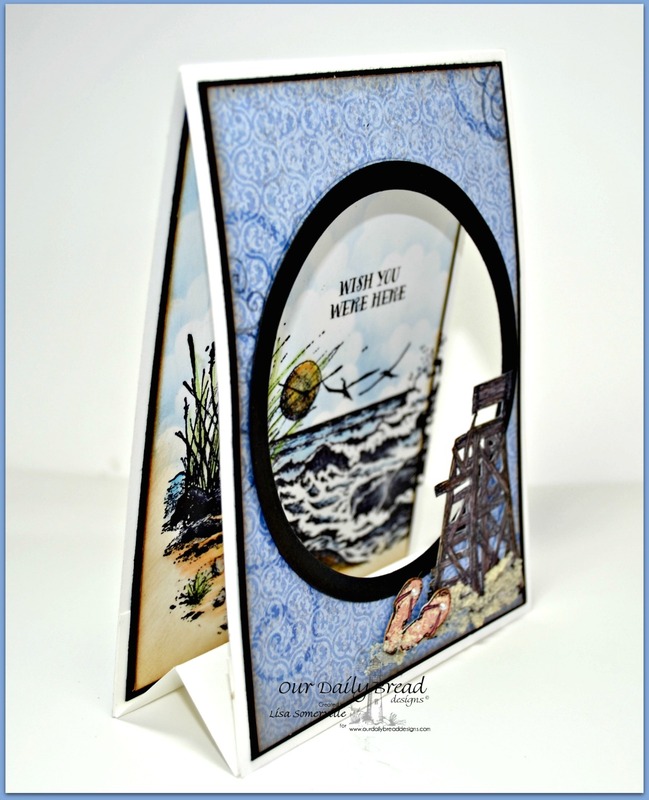 My first card is a Tent Fold Card, using Our Daily Bread Designs Flip Flop Fun, Life is Better, My Lifeguard and The Mighty Sea stamp sets along with the ODBD Christian Faith Paper Collection. All images are stamped in Black Archival. I adhered the pattern paper to Black card stock then to my card base, and die cut the opening using Spellbinders Circle Dies. I used two Circles layered inside of each other to die cut the "rim" panel from Black card stock. The image from The Mighty Sea is stamped on a White panel and colored using STAEDTLER Karat Aquarell Watercolor Pencils. I sponged Blue clouds and added the stamped sentiment from Flip Flop Fun, then adhered the stamped panel to Black card stock then to the inside of the base card. To embellish the outside, after stamping and coloring the lifeguard stand from My Lifeguard on White card stock, I "fussy cut the image and adhered it to my panel with glue dots. The flip flops are from the Life is Better stamp set, stamped on a scrap of pattern paper from the Blushing Rose Paper Collection and "fussy cut". To further embellish, I added Zva Creative pearls to the flip flops, and MuddPuddles Sand. 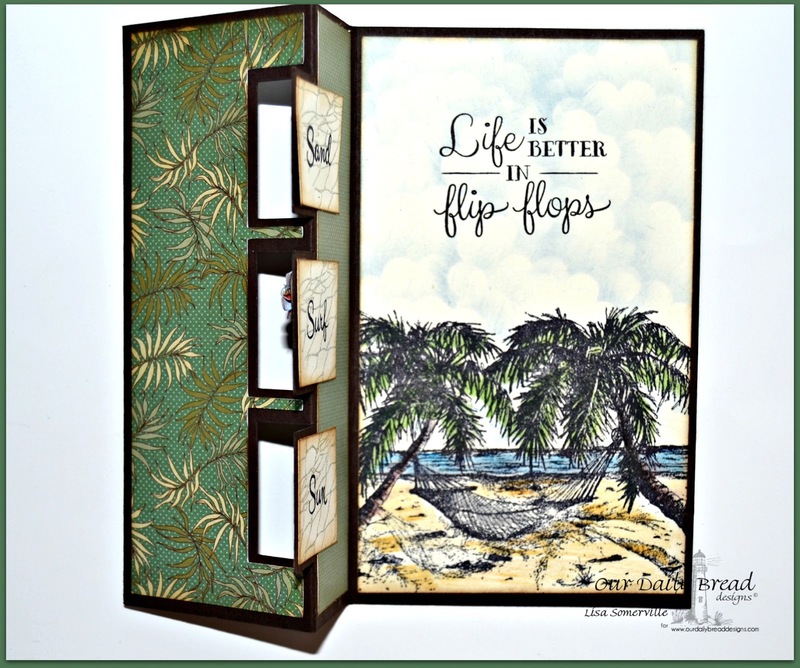 My Next Card is a Flip Swing Card using Our Daily Bread Designs Flip Flop Fun, Life is Better, Happy Retirement and Fishing Net Background stamp sets along with the ODBD Custom Flip Flops Die and Ornamental Crosses Die. All images with the exception of the Fishing Net Background are stamped in Black Archival. 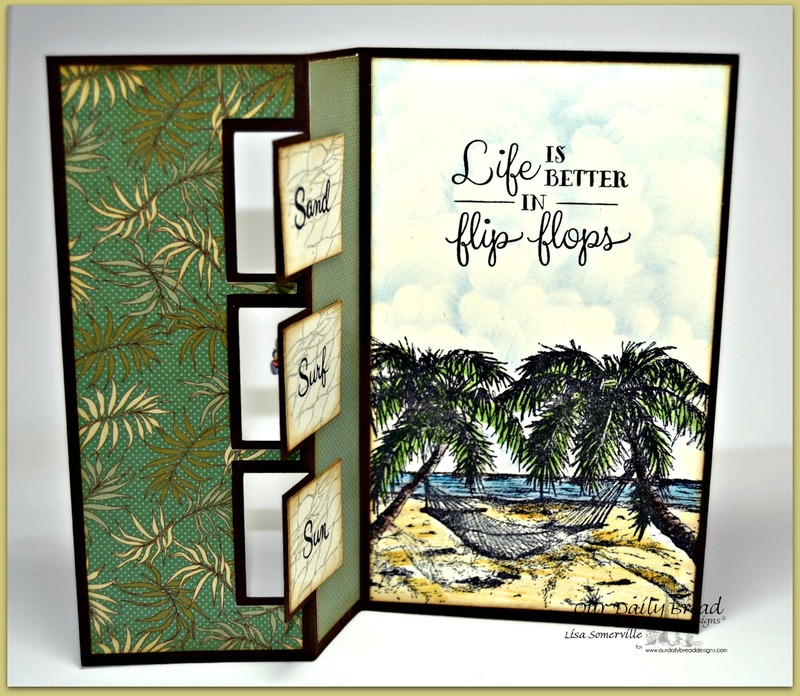 The square panels on the front and inside of the card are stamped using the Flip Flop Fun and Life is Better stamp sets. Then I stamped the Fishing Net Background in Weathered Wood Distress Ink over the stamped panels. The flip flops from Flip Flop Fun are stamped on scraps of the coordinating pattern paper, then die cut using the ODBD Custom Flip Flops Die. The embellish the Flip Flops, I die cut the flowers using the flower die from the ODBD Custom Ornamental Crosses Die, scrunched the flower and added Silver gems to the centers. I stamped the hammock image from Happy Retirement on a Vanilla panel, coloring the image with STAEDTLER Karat Aquarell Watercolor Pencils and adding the clouds with Blue ink. The sentiment is from Flip Flop Fun. Kelley will randomly be selecting 3 winners who will each receive a $15 gift certificate to Our Daily Bread Designs, good towards the purchase of ODBD stamps found in the "stamps column" of the ODBD Website, just for commenting on the Design Team cards! You have until Saturday, August 2, 2014 at 9:00 p.m. EDT to leave your comments. The Winners will be posted August 3rd, on the Our Daily Bread Designs Blog, so be sure to check back there to see if you won! Goodness, girl!! You have not only hit one home run, but two!!!! Both are absolutely incredible!!! Super clever designs, love the sets you combined for each! Awesome, awesome job on both!! HUGS!! Wowzers Lisa! Two AWESOME samples! I have to say we were on the same wave lenth as I also have started one with the Happy Retirement set. Love the card design with the Mighty Sea and the Lifeguard tower! Perfect way to showcase these ODBD sets!!! Both cards are absolutely awesome! I love nautical themed cards! FABULOUS cards! Love your images, colors and designs. wow!! The circle die reminds me of a ship portal and is perfect for this card!!! Love those flip flops at the base of the chair too!!! Lisa, I agree with Angie, they are both home runs! the papers and details on the second are fantastic too! I'm a big fan of cards that don't just sit there and yours' are fabulous! Lisa, I love seeing you use your amazing talents here on ODBD. Your beach scene with the lifeguard stand is fabulous. And those designer flip flops win the hearts of many! Beautiful beach cards! Love the images. Clever, clever! I love checking out the fabulous folds you use, Lisa! Love both of these gorgeous creations! The life guard chair in front of The Mighty Sea scene is genius! Your second card makes me long for the peace and serenity of a tropical paradise! Love them both! love both cards and how you combined the sets to do them!! 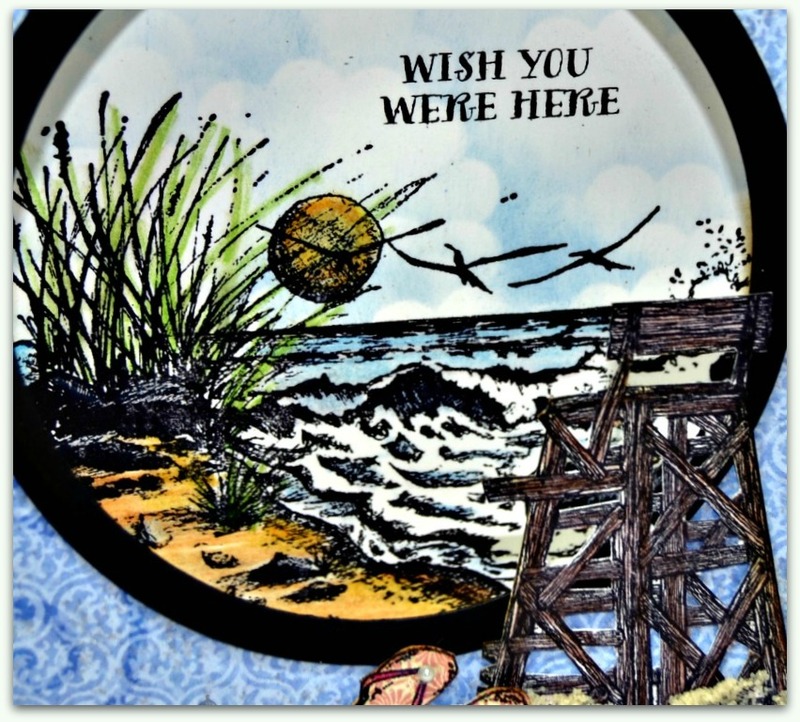 Lisa, I think my heart skipped a beat when I saw the Wish you were here card....that is a stunning creation! Stunning cards! I really love the layering and coloring on your first one. And the second looks so relaxing! Tfs! Beautifully done- loving the layouts on both of your cards- and the images- WOnderful!!! Lisa, your cards for this release are AMAZING!! I so love your folds with the scene you created on the first. I love the ocean on the inside of the card and the lifeguard chair on the front. Your second design with the Palms and the flip sentiments is so clever and beautiful as well. I have all these sets out for this release...guess great minds think alike. BEAUTIFUL work my friend!! Fabulous cards and designs Lisa! I agree...two clever creations :) !!! Definitely clever designs and amazing coloring! Beautiful projects! That tent card is absolutely amazing; it's probably the best one I've ever seen! Your coloring skills are fantastic!! I really like the flip card too. BEAUTIFUL doesn't begin to describe your work. Great folds on both cards. Oh what beautiful cards. Not only the super images but the way you built them up and coloured them. The styles of both cards are amazing. Thank you so much for sharing these beautiful cards! Nice, nice, nice! The first card wowed me with the cut out/opening and your fussy cutting is incredible. That was hard work! The second card is perfect for where I live! It's great inspiration because I have the retirement set! oh my.. I totally LOVE the tent fold scene! it just pops! and your flip fold is so cute! clever, clever you.... fab samples! Oh my I just love the way you combined these stamps and made a window for the scene, very cool and great coloring! 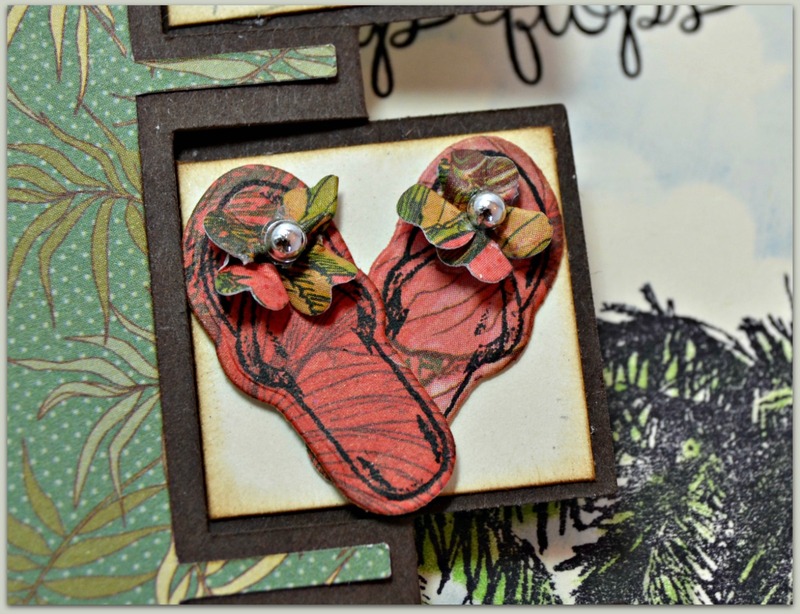 Love what you did with the second card too, like the pattern paper you chose for the flip flops and the calming scene inside is just terrific! Wow, I need to take a class from you on doing amazing things with folds and multiple stamps! Both these cards are absolutely amazing and have so much inspiration!! Lisa, your projects this month have absolutely blown me away. Your first is sooooooo beautiful and so creative - I love your card design, stamp choices and the fussy cutting - it's truly spectacular!! And if that's not enough you've offered a second sample that's equally as amazing!! The scene you created here is beyond fabulous. Hugs!! Your cards are both spectacular creations and am in awe of your creativity! You're a hard act to follow - lol! Love that the first card reminds me of a ship's port hole.